After an almost 10-year hiatus, The Press Club of Dallas is once again offering awards for journalistic excellence. 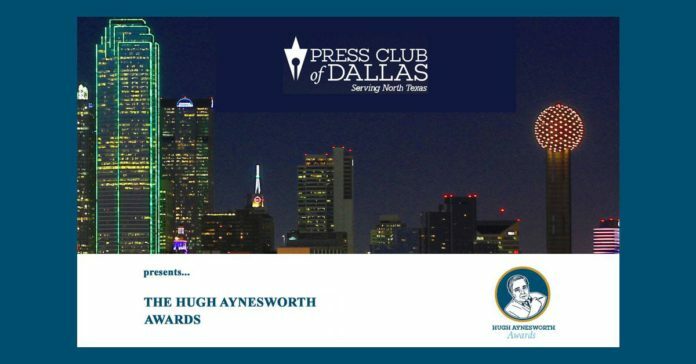 Submissions are being accepted at PressClubDallas.com for the inaugural Hugh Aynesworth Awards for Excellence in Journalism. The Aynesworth Awards are open to all journalists and their organizations throughout Texas. The award, first announced last year, is named after one of its most dedicated and active Press Club members, veteran award-winning writer and reporter Hugh Aynesworth. News organizations should submit investigative/enterprise work published or aired in calendar year 2016. Deadline for entries is April 15, 2017. The club’s awards committee has spent the past six months acquiring a strong panel of judges (list attached) – all of whom spent their careers outside Texas; clearly defining the rules; and identifying contacts throughout the state to make sure reporters and their editors are aware of the awards. The Aynesworth Awards replace the Katie Awards, which were dissolved nearly a decade ago. The awards dinner will be held in conjunction with the annual North Texas Legends presentation in early June, with more details to come soon. The fee to enter the competition is $55, with all proceeds going to further the mission of the Press Club of supporting journalism and communications in all its forms, including through scholarships for journalism students. Originally formed as group in 1948, The Press Club of Dallas is a dynamic organization of journalists, and professional communicators, in North Texas committed to promoting the discipline of journalism, communication, literacy, current affairs and First Amendment freedoms. We value the development, and protection of journalism. Journalists, communications professionals and students may join the Press Club of Dallas.